My DIY home studio was in my opinion the most makeshift a home studio could get. The only material is used were a stool that was roughly 3 feet tall, four pieces of foam core, two black and two white, rectangular hardwood floor tiles which I had applied a finish to them, and a tube fluorescent light, tape and push pins. 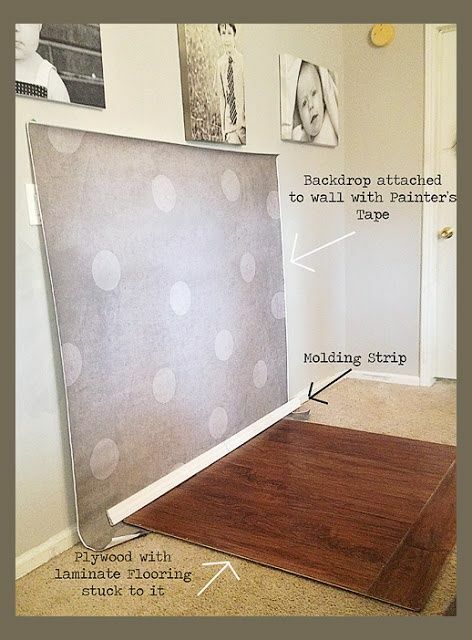 I would put a white or black piece of foam core on the stool depending on the projects look; then I would put another piece at the back of the first at a perpendicular angle soi could clean the background, they stood perfectly because I used push pins. Following that I would hang the fluorescent light in certain places around the object to get the lighting effect I needed. This was a good setup because it was sort of portable, in a few shots I moved into my living room at night where I had no light except the fluorescent, which I consider my key light. In other shoots I placed the setup near my couch where I had a window and could use a little bit of natural light. 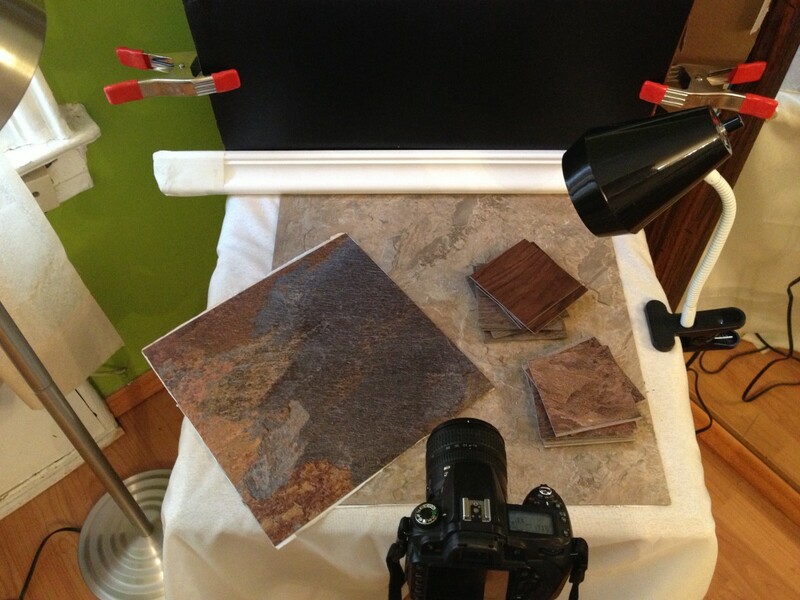 The wooden floor tiles came in pretty handy when I did the shoe photo project. I placed a few tiles on the foam core then put the shoe on the tiles and I used a leather wingtip so the combination was perfect. 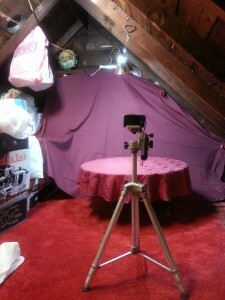 This entry was posted in HW1: DIY Studio on May 22, 2014 by John Bhatia. 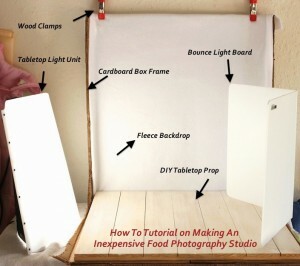 For my DIY Studio, i didn’t have some of the materials that the tutorial was showing/asking for, so since i have a lamp that gives a good amount of light, soft like the ones in the studios, I thought that my lamp was great for this mini project at home. I also used left over material from previous classes. I used two white boards and the a black one for back up. 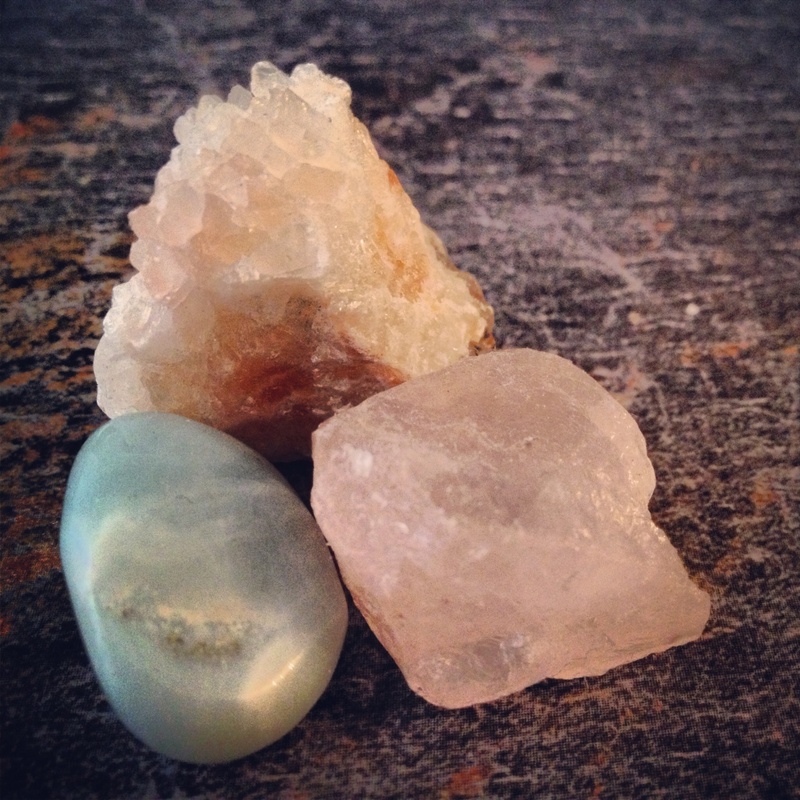 This entry was posted in Homework, HW1: DIY Studio on February 11, 2014 by Rocio. 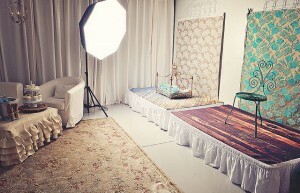 Setting up the DIY Studio was fun and challenging. 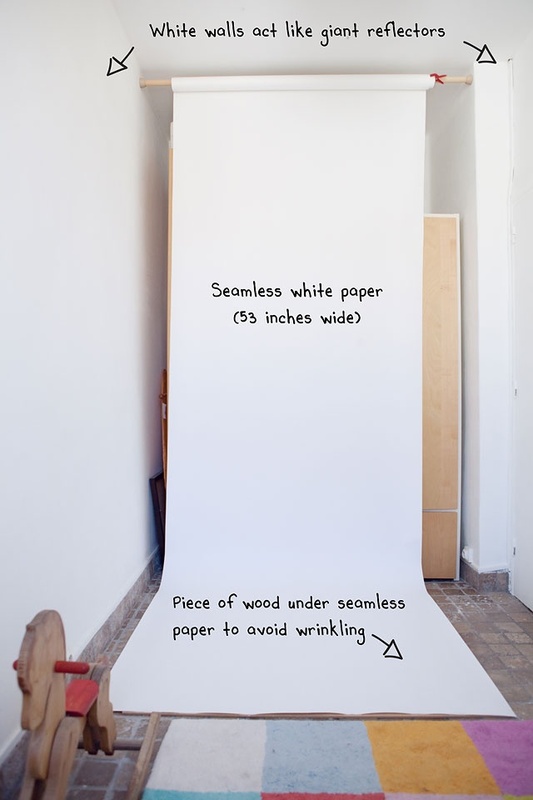 After watching the video I did some research to find photos of DIY studios that would inspire me. I found some very interesting ones that I wanted to share with the class. My second step was checking what I could find at home. I found a little coffee table, tracing paper, camera and tripod. I needed more supplies so I went to Lowes and got one clamp light for $9 and one light stand that could be adjusted for height and had three adjustable lights too for $29. I bought two A-clamps for around $2. I had no time to look for other things like backgrounds so I decided another day to try out Home Depot. I was able to find different floor slate textures that I bought for less than a dollar. I also got plenty of different free small samples that I could use for future projects maybe or maybe not. I also got a piece of small luxurious moulding for less than a dollar. My final and most challenging step was finding space. I was able to find a corner that has a big window with natural light and on the opposite side a big mirror. For foam boards I’m using some ply wood that has black on one side and white on the other. 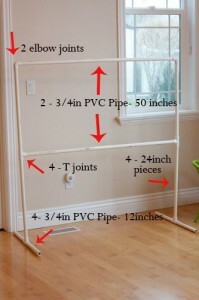 If I think that I need bigger pieces maybe I will buy those too. So here is what I came up with for right now and I could dream very soon that I will have a set up like the pictures above 🙂 Pictures below taken with a camera phone. Sorry for all the pictures could delete them after this assignment. This entry was posted in Homework, HW1: DIY Studio on February 4, 2014 by Diellza Kasimi. This is my DIY photography studio and is still in the prosses of getting better and improving as I experiment with the light and find a better placement. To start I had no idea how to accomplish this and try to get a few ideas from whatever I had available at home. First I found a light that’s been in my closet for a few months that I’ve never use before it was exactly what I needed according to the few blogs and videos I watched. It also came with a clamp that was really helpful to keep it in place. Next I needed some type of stand and I didn’t seem to find any and opt to use a chair as a temporary placement. 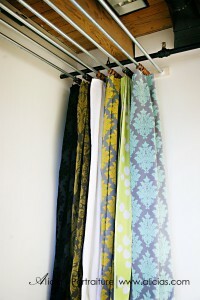 I also needed some type of backdrop and I notice that I had a few rolls of left over Christmas wrapping paper. My idea is to use the blank side as a back drop and revers it to the color side as a color backdrop. This paper can also be use as a diffuser as is thin and can be warily place around the light. In this picture there’s also a black cardboard that can be place anywhere to use as contrast or just to experiment with a few color. 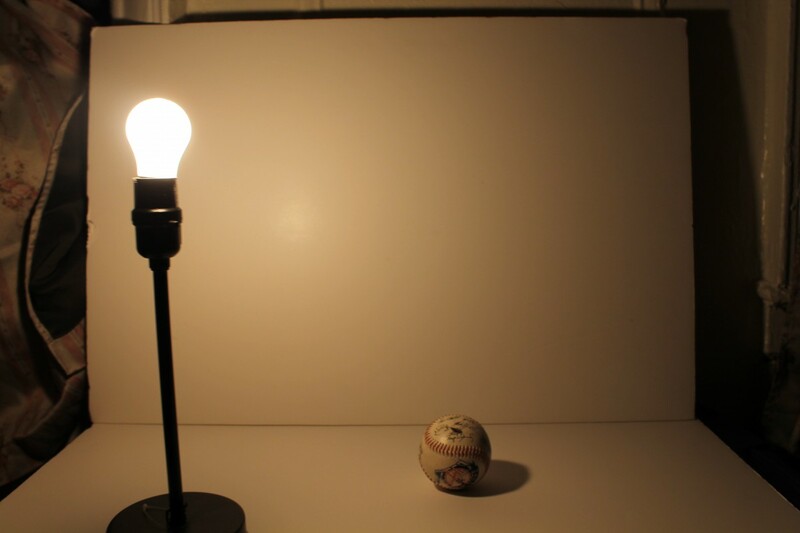 A few of the challenges I think I will encounter are the fact that I don’t seem to find any other stands for the light and also the type of light that I can use as there are different lightbulb to choose from and plan on getting a few different ones to experiment with the light. One thing that I forgot to include was a small tripod that can be place in front of the chair and easily move around with no need to adjust the other elements also a morrow to use a reflection to be combine with the light and create different types of light on the subject . I have a few more ideas to increase the quality and variety of photos that can be taken in this small studio that need more materials such as getting more lights. This entry was posted in Homework, HW1: DIY Studio on February 4, 2014 by Hery Tobon. as I was looking at the items that I need to buy I had no idea what was an a-clamp (but there was a picture next to it.) I was going to go to a hardware store which they also cut wood, think I was going to buy a stick so I can use it as a stand for the light. But then I remember that I have a light stand. I still brought a light clamp just incase. which I feel I have more control of directing the light where I want. The last thing was the tripod, I couldn’t find my old one so I had to buy at bestbuy, the closet electronic store. At the end of the day, it all turn out okay. It was a lot easier to make than I thought and I can’t wait to use it. This entry was posted in HW1: DIY Studio on February 3, 2014 by Miguel Morales. I’m pretty used to doing this with my camera, minus the tripod ad the light, so it felt natural to me. The only thing that was bothering me was what type of light to get. 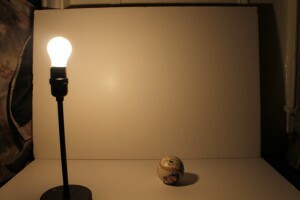 I needed to replace the one in my room and I wanted a daylight bulb, however, that light would affect my final image if I got let’s say a bright white or a soft light, so I decided to get a daylight bulb for my set up too. I light the effect it gives. I own many figures like the one in may image, smaller and even larger than that one and daylight light to me presents figures the best. The lamp I got actually saves me a lot of time because even though there’s no diffusion made by me, the lamps head actually is the diffuser. As you can see in both shots(left by hand, right in the tripod), there aren’t any harsh shadows. I tried making some but the images never came out well or just too dark, even with a fill(which I do not have shown). Overall, now with the tripod and the lamp, I’m much happier taking pictures in my “studio”. 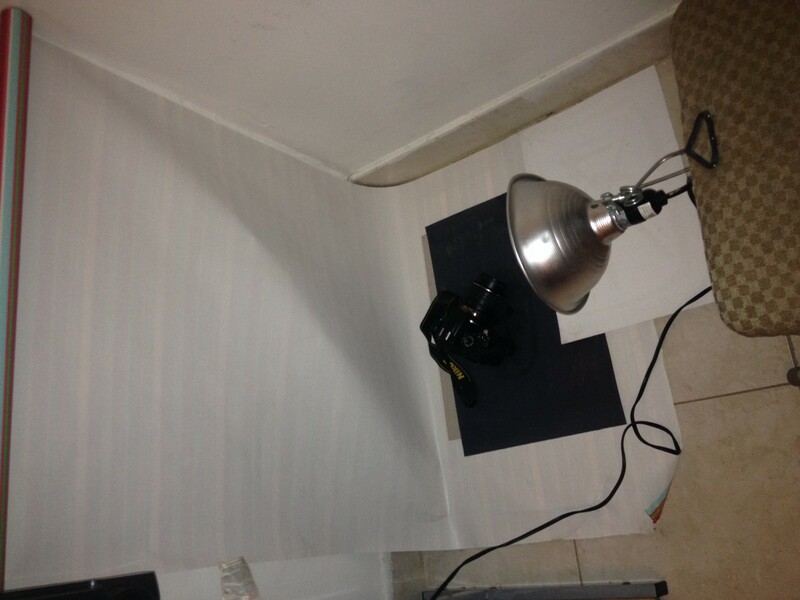 This entry was posted in Homework, HW1: DIY Studio on February 3, 2014 by angelopena. After hearing about setting up a home photo studio, I was at first stressed out about the whole situation; but after speaking to a few of Professor Michals’ old students I calmed down and started planning. First thing I had to do was to figure out a location for my studio. At first I figured my room would work perfectly, All that was need was moving my junk off the desk and placing everything on top, so therefore after getting home that Tuesday night I would begin creating my home studio but soon realized I couldn’t move around with a camera in my tiny room ! Therefore I had to move to my second option which is the dining room. The dining room was a perfect spot theres a large space and big table, the only thing I would be giving up is my privacy and not being bothered my anyone. 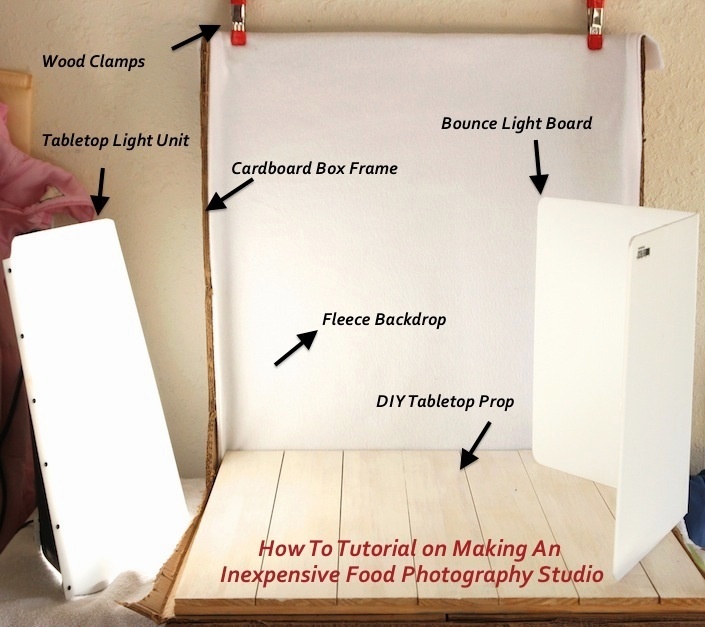 Second part of my planning was to either build the studio or purchase a light box. 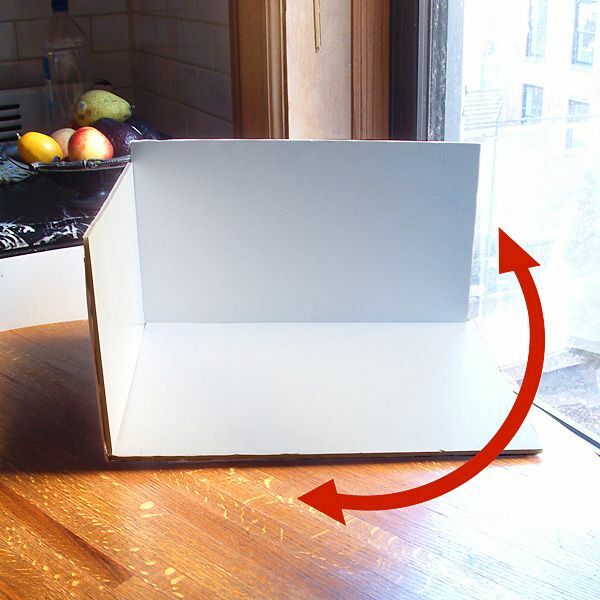 My first choice was to build the studio over this past weekend but after speaking to a former student of the professor, he explained how buying the light box from Amazon is a much easier solution than to build it. However luckily he offered to give me his studio because he no longer needed it. After hearing the great news and having a massive amount of weight off my shoulders, I made plans to buy a tripod. My search for a affordable tripod however has not started due to my bad memory, but I should be able to purchase one very soon. 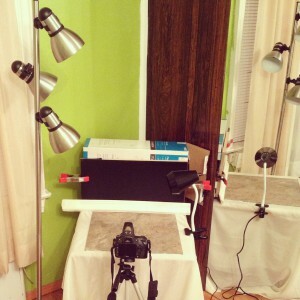 Overall my experience with the DIY home studio has been incredibly easy and quite cheap! I only hope that my pictures taken with my home studio will not only help me receive a good grade but also provides some great photos. 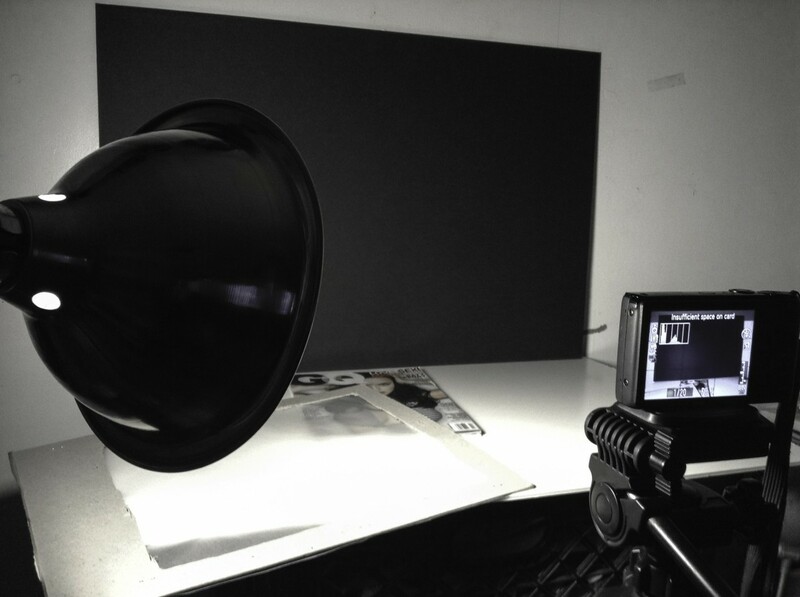 This entry was posted in Homework, HW1: DIY Studio on February 3, 2014 by Timothy Lok. Setting up my DIY studio was probably the most challenging homework assignment that I’ve ever had to do. I managed to get most of the items together this weekend. I’ve set up a corner on my attic. I used a round, glass table I found in the attic for placing my props on. Using the ring clamps I purchased from True Value, I hung a dark, solid sheet I’m using as the backdrop. I’ve my clamp lights (which I also purchased from True Value) hanging on the slanted wood beams of the attic top. I’ve set my camera up with a tripod I found in the attic. I think I’ll throw tracing paper over the clamp lights to use as my diffusion screen. The materials weren’t as big a challenge as arranging the space but luckily that worked out fine. I moved some boxes out of the way to move the table to the center of my DIY area. There were also a bunch of things on the table itself. I moved them all to the other side of the attic across from where I packed the boxes. After attaching my camera to the tripod, I practiced angling the tripod; this way I could get used to it for when I began shooting. I also haven’t used this camera in a while, especially since I got my new phone, which has a pretty good camera. The only other studio I’ve shot in is in school and I’m looking forward to shooting in my new DIY studio. This entry was posted in Homework, HW1: DIY Studio on February 2, 2014 by Natasha Khemraj. The table I used was a small, 2-foot by 2-foot end table. 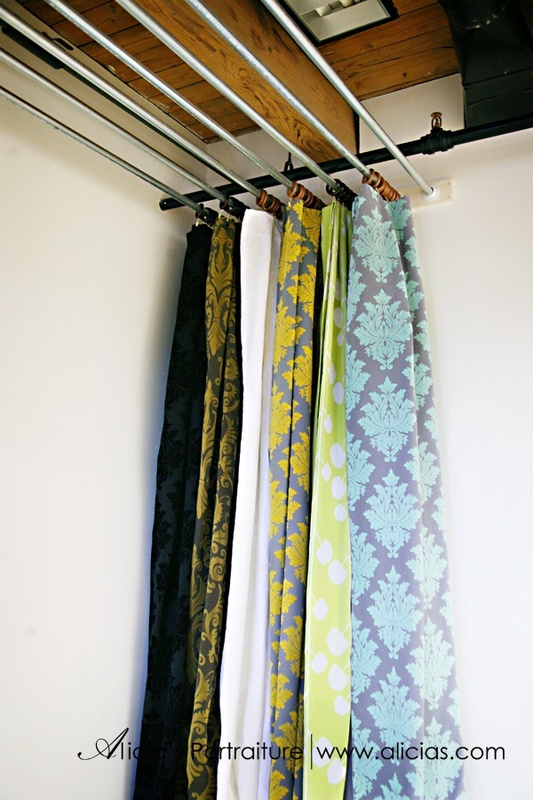 I put a cloth over it and positioned it in front of the backdrop I am using, which is the dark blue curtain to my closet. For my own personal stick in a can, I just used a 6-foot adjustable mic-stand that I have and tied my key light to it. The key light I used was simply a good flashlight I had lying around. The mic stand turned out to be perfect because it is height adjustable with no assembly required! To clamp the flashlight onto the mic stand was a little difficult but once I found string to tie it securely to the stand, it was a piece of cake. For my light diffuser, I simply removed the cork from a cork board so that all I was left with was a wooden frame that was about 1-foot by 1-foot. I took a piece of tracing paper and taped it to the frame and voila! I seem to have very sheer tracing paper so when it comes time to actually shoot, I might need two pieces of it, which i can always do later. Lastly, for my reflective surface, I took my other cork board (no removal of the cork required), and I took some aluminum foil and covered one side of the cork board with it and it seems to be working fantastically. I still have not gotten a chance to get my clamps yet, but I fully intend to pick up some clamps from the hardware store so that I can secure the diffuser/fill light to the table, because at this point they do stand up on their own but they fall over easily. The best part about my whole setup is that luckily, my closet is right near the window so if I shoot in the daytime I will have both natural light and my key light if I choose so. This entry was posted in Homework, HW1: DIY Studio on February 2, 2014 by MCruz. 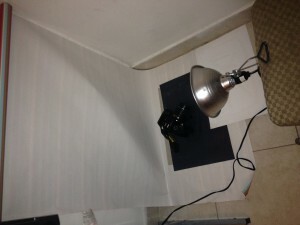 This entry was posted in Homework, HW1: DIY Studio on June 15, 2011 by rmichals.